Get a description of what is causing the retail collapse and how companies can utilize Big Data and Machine Learning analytics to compete and thrive in an Amazon world. Retail stores are dying — at least, those not online are — but Big Data and Machine Learning may be able to help. 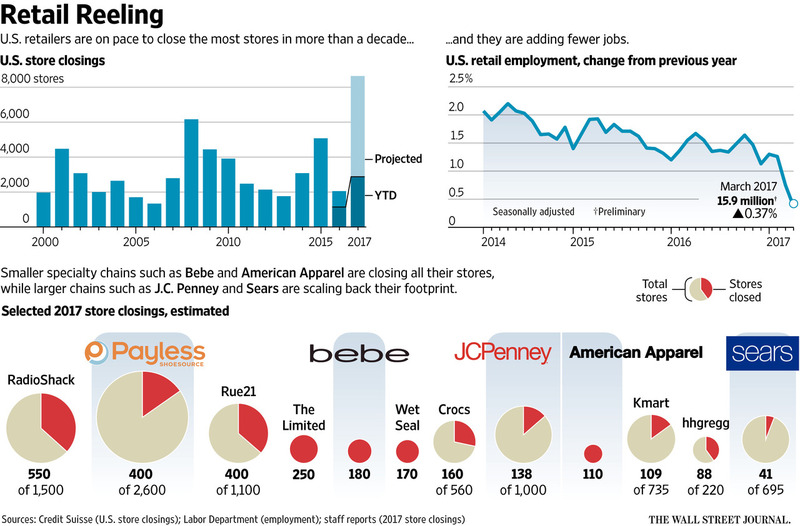 We are barely halfway through 2017, and the U.S. business media is rife with stories of major retailers closing storefronts. It's undeniable that the retail industry is in the midst of structural change. According to a research report from Credit Suisse, around 8,600 brick-and-mortar stores will shut their doors in 2017. The number in 2016 was 2,056 stores and 5,077 in 2015, which points to industry malaise. The retailer’s bigger cousin, the neighborhood mall, is not doing any better. There are around 1,200 malls in the U.S. today and that number is forecast to decline to just about 900 in a decade. It is clear that in the coming years, retailers (and malls) across the board will remain under pressure due to a variety of changes — technological, business model, and demographic. So, what can legacy retailers do to compete with and disarm the online upstart? This has been a year of otherwise strong economic expansion. Typical consumer indicators that influence consumer spending on retail are generally pointing upwards. Just sample the financial data. The U.S. has seen increasing GDP for eight straight years, the last 18 months have seen wage growth for middle and lower income Americans and gas prices are at all time lows. These kinds of relatively strong consumer data trends cannot explain a slowdown in physical storefronts. Consumer spending is not shrinking to declining affordability. The retailers that have either declared bankruptcy or announced large-scale store closings include marquee names across all different areas of retail. Ranging from apparel to home appliances to electronics to sporting goods. Sample the names – Sports Authority, RadioShack, HHGregg, American Apparel, Bebe Stores, Aeropostale, Sears, Kmart, Macy’s, Payless Shoes, JC Penney, etc. This is clearly a trend across various sectors in retail and not confined to a given area. Some of this storefront retail bubble burst can definitely be attributed to physical retail expansion. The first indicator is the glut of residual excess retail space. The Wall Street Journal points out that the retail expansion dates back almost 30 years ago when retailers began a “land grab” to open more stores — not unlike the housing boom a decade or so ago. North America now has a glut of both retail stores and shopping malls, while per capita sales have begun declining. The U.S. has almost five times retail space per capita compared to the UK. American consumers are also swapping materialism for more experiences. Thus, an over-buildout of retail space is a cause of the ongoing crash. We now live in a world where online single-click shopping is the dominant retail trend. This is evidenced by declining in-store Black Friday sales in 2016 compared to increased Cyber Monday sales. As online e-commerce volume increases year after year, online retailers led by Amazon are surely taking market share away from the brick-and-mortar retailer who has not kept up with the pace of innovation. The uptick in online retail is unmistakeable as evidenced by the below graph depicting the latest retail figures. Department-store sales rose 0.2% during the month, but were down 4.5% from a year earlier. Online retailers such as Amazon posted a 0.6% gain from the prior month and a 11.9% increase from a year earlier. Legacy retailers are trying to play catch-up with the startups who excel at technology. This has sometimes translated into acquisitions of online retailers (i.e. Walmart’s purchase of Jet.com). However, the global top 10 retailers are dominated by the likes of Walmart, Costco, Kroger, Walgreens, etc. Amazon comes in only at #10, which implies that this battle is only in its early days. However, legacy retailers are saddled with huge fixed costs and investors who prefer dividends to investments in innovations. Their CEOs are incentivized to focus on the next quarter, not the next decade like Amazon’s Jeff Bezos is. Though traditional retailers have begun accelerating investments in cloud computing, Big Data, and predictive analytics, the web scale majors such as Amazon are far ahead of typical retail IT shop. The fastest growing retail industry brands are companies that use Big Data as a core business capability to impact the customer experience versus as just another component of an overall IT system. Retail is a game of micro customer interactions that drive sales and margin. This implies a retailer’s ability to work with realtime customer data whether it’s sentiment data, clickstream data and historical purchase data to drive marketing promotions, order fulfillment, show-rooming, loyalty programs, etc. On the back end, the ability to streamline operations by pulling together data from operations and supply chains is helping retailers fine-tune their operations (especially from a product delivery standpoint). So, what makes retail somewhat of a unique industry in terms of its data needs? I posit that there are four important characteristics. First and foremost, Retail customers (especially millennials) are very open about sharing their brand preferences and experiences on social media. There is a treasure trove of untapped data out there. Secondly, leaders such as Amazon use data and a range of other technology capabilities to shape the customer experience. It's the other way around for traditional retailers. They do this based on predictive analytic approaches such as Machine Learning and Deep Learning. Amazon has now morphed from an online retailer to a cloud computing behemoth with its market-leading AWS. In fact, its best in class IT enabled it to experiment with retail business models like the Amazon Prime subscription at $99 per year, which includes a free delivery, music, and video streaming service that competes with Netflix. As of March 31, 2017, Amazon had 80 million Prime subscribers in the U.S., an increase of 36 percent from a year earlier, according to Consumer Intelligence Research Partners. Thirdly, retail organizations need to begin relying on data to drive real-time insights about customers, supply chains, and inventory. This data, however, spans from traditional structured data (i.e. sales data, store-level transactions, customer purchase histories, supply chain data, advertising data, etc.) to non-traditional data (i.e. social media feeds, as there is a strong correlation between the products people rave about and what they ultimately purchase, location data, economic performance data, etc.). This data variety represents a huge challenge to retailers in terms of managing, curating, and analyzing these feeds. Fourth, retail needs to begin aggressively adopting the IoT capabilities that they already have in place. This implies tapping and analyzing data from in-store beacons, sensors, and actuators to enable new business models. None of the above analysis claims that physical stores are going away. They serve a very important function in allowing consumers a way to try on products and allow for the human experience. However, online definitely is where the growth primarily will be. Reinventing legacy IT approaches:Adopting cloud computing, Big Data, and intelligent middleware to re-engineer retail IT. Changing business models by accelerating the adoption of automation and predictive analytics: Increasing automation rates of core business processes and infusing them with predictive intelligence to improve customer and business responsiveness. Experimenting with Deep Learning capabilities: The use of advanced AI such as Deep Neural Nets to impact the entire lifecycle of retail. Adopting a digital or a "mode 2" mindset across the organization: No technology can transcend a large digital gap without the right organizational culture. The theme across all of the above these strategies is to leverage digital technologies to create immersive cross-channel customer experiences.